As the government and airlines are each seeking to develop a competitive environment, a state monopoly on the national rail system remains firmly in place through Russian Railways. While freedom of movement for Russian citizens is enshrined in the Constitution, practical social and economic factors often impede its full implementation. The development of regional air travel, abetted by a series of state subsidy programs and last month's launch of Aurora, the Far Eastern subsidiary of national carrier Aeroflot, is one point in the government strategy to overcome this challenge. "Yes, in some locations, [railways] are a natural monopoly, where, unfortunately, it is simply impossible to build regional airports or something like that, in order to develop an alternative," Shenk said. "So a requirement for subsidization definitely arises in order to preserve some kind of defined frequency of trains." In general, however, competition in both industries - in regions where demand is high - is a better way to ensure efficient pricing, Shenk said. "To subsidize railways simply because we need to keep cheap tickets is wrong," he said. "Here there should be competition between budget [air] carriers, which are still just being created, and railways." The subsidies "are needed for the support simply of the mobility of the population," he said. "From an economic point of view, this is important." 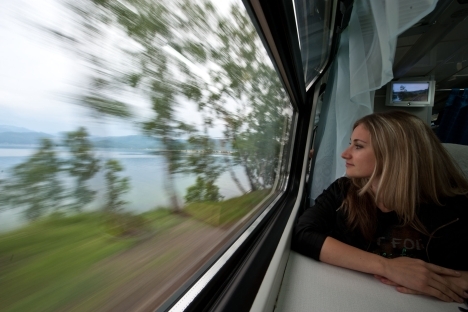 The competitiveness of rail in the face of airlines has been growing due to the popularity of RZhD's Sapsan express service, connecting Moscow with St. Petersburg and Nizhny Novgorod. "It's not the frequency of the trains to a specific destination, but possibly the ability of the trains to get to the right speed, even if the tracks are used by multiple, different trains," Kazbegi told The Moscow News. "On certain sites, they have a dedicated line where you actually do have these high speeds." High-speed rail, which is under development between Moscow and Kazan - a project announced in June by President Vladimir Putin at the St. Petersburg Economic Forum - is looking to build on the foundations of the Sapsan, but faces several challenges. One is the inherent long-term nature of the investment, Investcafe's Shenk said. "The economy is always one of the very big questions, because upon investing in [rail infrastructure], the timeframe for earning back the money is very long," he said. "Therefore a stable passenger base is necessary." "To take, for example, the Moscow-Kazan route, the situation is very similar [to St. Petersburg], but there are already worse prognoses for the passenger base, and a lower price will have to be put on the tickets," he said. The threshold for competitiveness between air and rail - beyond which air should dominate - is reached at around 800 kilometers, Kazbegi said, the distance of the proposed Kazan line. "Clearly there is a very different development pattern there," Kazbegi said. "If the ability [comes] to convert the rail station into a real estate project, possibly with a shopping center being created around it, then I think that will be attractive to private [investors]," he said. "But if it has some limitations - an unclear ownership structure, an unclear division of the ownership and responsibilities - then of course that's not going to be very interesting."